Only Make Believe offers a variety of volunteer opportunities for individuals looking for a way to make a difference and get more involved with our programs. As an Only Make Believe Volunteer, you can join in a group activity or even participate from home! To each performance, we bring a trunk full of costumes for the kids to wear as are part of each show. As a result, we’re always looking for enthusiastic individuals with sewing skills! One of our most popular costume items are our fabulous capes and we need talented individuals to create them. Join the Cape Crusade and we’ll provide you with all the materials. Email Patrice Christu (pchristu@onlymakebelieve.org) in New York or Chris Wilson (cwilson@onlymakebelieve.org) in DC for more info! Bring a group of 5 to 12 volunteers to share the fun of an Only Make Believe show! Your group will travel to one of our hospitals, decorate the playroom, enjoy the show performed by Only Make Believe actors, and throw a party for the kids. Email Cary Simpson (csimpson@onlymakebelieve.org) for more info! *This event includes a fee to cover materials. Sometimes a child needs a helping hand during a performance or a caring person to give them a little extra attention. An OMB Buddy joins actors on-site to help dress children in costumes, assist hospital staff in bringing kids to the workshop and brighten a child’s day. 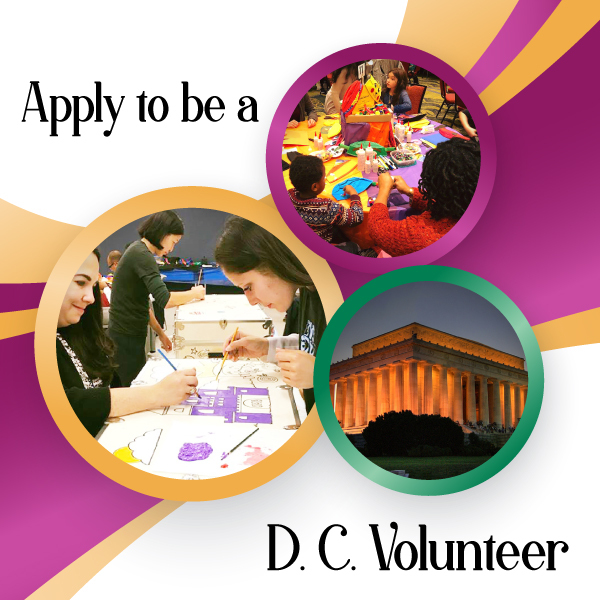 Click on the application below or contact: Channie Waites (cwaites@onlymakebelieve.org) in New York or Chris Wilson (cwilson@onlymakebelieve.org) in DC for more information.